The name itself gives this elegant collection from Nourison a luxurious feel. The Silk Shadows range is a feature collection from the leading rug designers and it includes a fascinating choice of opulent rugs which also benefit from being super-soft, almost silken and perfect to bring richness to any modern home. Stunningly elegant with their premium quality design and construction, each rug in the Silk Shadows collection brings something unique to your home. 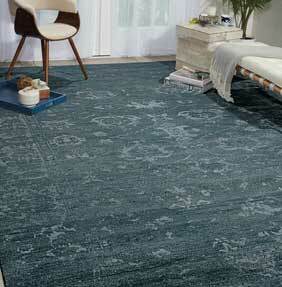 Each rug is carefully woven by hand using premium wool and bamboo fibres, which have an almost silk-like softness. Highest quality New Zealand wool yarn combines with the bamboo to create a natural sheen and beautiful finish to each Silk Shadows rug. Another added bonus of this yarn combination is it is much more durable and easier to manage than those using real silk fibres. Each contemporary rug in the Silk Shadows range is hand carved and hued too, ensuring every element is closely monitored for an exceptional finish. This also allows beautiful colourways and elegant designs to be perfectly crafted every time.